Bring out the football jerseys! 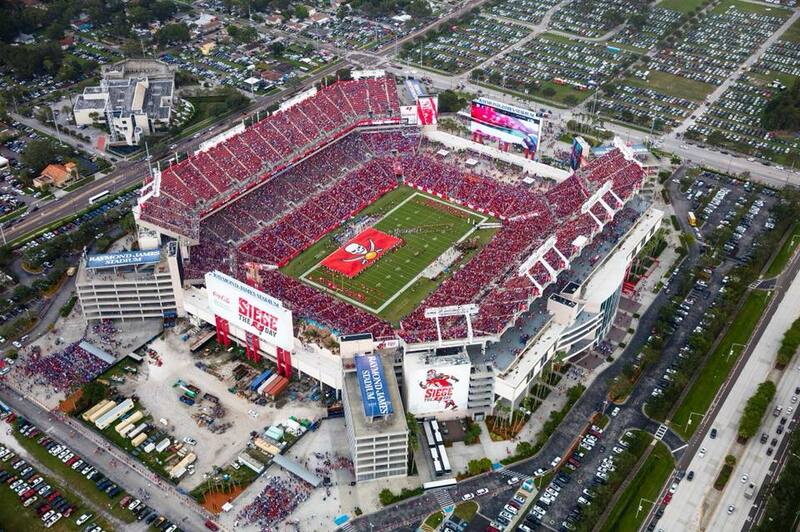 Win or lose, we've got to cheer on our hometown team this NFL season—the Tampa Bay Buccaneers, of course! Looking for where to watch the Bucs with some brews and delicious bar food? Here is a list of the places open and playing the Bucs games for you to watch the Buccaneers during this NFL season. The Anchor Bar’s Downtown location is ready to hear the cannons during the Bucs games this season. Get some Jalapeno poppers to start and a beer, then maybe work your way to their long list of various burgers and sandwiches by the end of the football game! Made with the sports enthusiast in mind, make your way Downtown on Franklin to Hattricks if you’re looking for a wide variety of craft and local beer! With big screen HD TVs and surround sound, it’ll make you feel like you’re sitting at Raymond James Stadium but with kind wait staff and bartenders to help you out with your selection of food and drinks. The Press Box is Tampa’s original sports emporium and eatery! Right down the road from the stadium in South Tampa, this is always ready to support the Bucs through the season with their several screens and an extensive menu to serve you throughout the game so you don’t miss a play! Found on Kennedy in the Channelside District, Maloney’s will be open to watch the Bucs games throughout the NFL season! This Irish Pub has the classic bar foods such as wings and burgers for your game time experience, but they also have Irish fare such as Shepherd’s Pie! For drink specials, all day every day they have $3.50 Maloney’s Red Drafts, $5 House Wines, and $5 Car Bombs! Duffy’s is the place if you’re looking for a hearty meal while watching the Bucs game! Join the great staff in cheering on the Buccaneers with a rack of ribs, some beer, and fried mushrooms. If you’re looking for a large variety of flavored wings, Buffalo Wild Wings is the perfect location to relax, eat, and support the Bucs! Customize your game time wings with one of their signature sauces or seasonings and watch the game on one of their many TV screens lining up the walls. For Ducky’s in South Tampa, being a sports lounge is a way of life and watching the local team is a must! Come to Ducky’s to watch the Bucs play, but also enjoy one of their four mini bowling lanes! Elmer’s is the place for large meal portions, tasty wings, and game time! While watching the Bucs on one of their TV screens, Elmer’s offers a variety of things to do such as darts, card tables, and pool tables. In Brandon, O’Brien’s is an Irish Pub that is playing the next Buccaneer football game and to ready to serve you and your friends! Come grab a drink and watch the Bucs play on one of their TV screens! Some nights, listen to live music while you watch the Bucs play for that W! In Centro Ybor, GameTime Family Entertainment Center is open with a restaurant, sports bar, and over 60 HDTVs to watch news, games, and sporting events! Even if you are playing games throughout the large entertainment space, you’ll be in eyes-view of the Buccaneer game somewhere! At Winghouse Bar and Grill, sports games are always playing in the back — and watching the Bucs football games is no exception! With kind staff, many locations around Tampa, and fan favorite meals such as the Jumbo Combo Platter that has two beef sliders, boneless wings, and original wings, enjoying a Bucs game is made easy! In North Tampa on Bearss, Bobalouie’s says “if it’s televised, it’s playing at Bobalouie’s!” Bring your friends, share some food, and watch the Buccaneer game as it will be playing on their 16 wide-screen LCD HDTVs! Found on 56th in Temple Terrace, Gaspar’s Patio Bar & Grille is loaded with craft beers to assist you in your Buccaneers game experience! A variety of Ales, Stouts, Wheat, Infused, Ciders, and more are available to order alongside sharables such as an order of 50 Jumbo Chicken Wings, perfect for cheering on our local team. In North Tampa by Tampa Palms, a classic place to watch games of all types is Peabody’s! With several TVs on almost every wall, there’s no way you’ll be missing a Bucs game here. Packed with food and drink specials, this entertainment complex is perfect for anyone trying to support the Bucs. World of Beer is the place to be if you’re wanting something simple: beers and the Bucs! At the Fowler and SoHo locations of World of Beer, watch the Bucs game on one of their crisp TV screens and split a plate of Tavern Tots with your pals! At the Carrollwood location of Beef O’ Brady’s on Himes, come watch the Bucs game and enjoy their specials! Depending on game days and location, Beefs offers 5 weekdays’ worth of specials during the week for you to enjoy your time watching the game! Tucked inside Westchase, McDivot’s has everything to offer when it comes to going to bar for a football game! Start off with potato skins and move onto fried pickle chips, then maybe share the supreme nachos for the Bucs game! In Town & Country, Charann’s Tavern is found on Memorial and is open for your own personal Bucs watch party! Offering their TVs to watch, MLB, NCAA, NHL, and NFL games, Charann’s is ready to serve you food and drinks this NFL season! Stay connected to all the cool things happening in Tampa, check out Things to Do, Sports, and Dining! Be sure to register to 813area and 727area so you don’t miss the next play in Tampa Bay—it’s free!